The Lumos helmet has a built-in light. Testing it has changed how I ride. Photo illustration by Slate. Image by lumoshelmet.co. Safety is a top priority for many cyclists. Take a quick jaunt through a popular cycling destination, like the affluent Bay Area suburb of Woodside, and you’ll see riders wearing brightly colored spandex or donning vests or jackets in high-viz neon yellow—an effort to stand out to motorists among the colors normally spotted in nature. Others opt for gear with reflective accents that shine bright white when headlights strike them. But one of the best ways a cyclist can ensure visibility in a sea of cars is with bike lights: a white beam illuminating your path ahead and a red taillight warning cars of your presence. The first forms of bike lighting date back to the early days of bicycles themselves, in the mid– to late–19th century. Back then, riders would attach oil lamps to illuminate their way. Today, bike lights are a booming industry with dozens of players and models to choose from, and they’ve recently expanded beyond devices you affix to your bike. Lumos, a Kickstarter project that began shipping in late 2016, builds on the idea that lights are a central part of the cycling experience by building them straight into another critical piece of gear: your helmet. “By being an integral part of your helmet, these lights are naturally higher, larger, more distinctive, and easier to see than traditional bicycle mounted lights,” the company said in its Kickstarter product description. Its founders, cyclists Eu-wen Ding and Jeff Chen, developed the helmet after feeling unsafe on the road, particularly at night. They wanted to design something to help riders be more visible to car drivers—something that you also wouldn’t accidentally forget at home, charging on your nightstand. Lumos has shipped more than 20,000 helmets to bike riders around the globe, particularly commuters looking to make their daily trips more safe; California and New York are two of the most popular U.S. states for Lumos orders, but the helmet is also gaining traction in the U.K. The company says it has seen a jump in sales this holiday season. Although a rare breed, the Lumos isn’t the only helmet of its kind. Thanks to lightweight, highly efficient LEDs, smaller, more powerful batteries, and improvements in making these electronics watertight and weather resistant, wearable light technology is becoming more common, particularly in cycling apparel. The Bell Connect, for example, is another helmet that features an integrated red taillight. A handful of jackets, such as the Métier Beacon jacket and Proviz Nightrider LED, have also started integrating lights into their designs to make riders more visible. Five or 10 years ago, having a bike light last the length of your entire ride was a feat; now, you’ve got smaller, more powerful lights built straight into the things you wear each ride—and their batteries last for days. I’ve been testing out the Lumos helmet, and it’s changed the way I ride. The helmet features a Tron-style strip of white LEDs across its front and an array of 38 red and white LEDs on back. Typically, the LEDs centered on back glow red in the shape of a triangle, with lights on either side shaped like arrows. 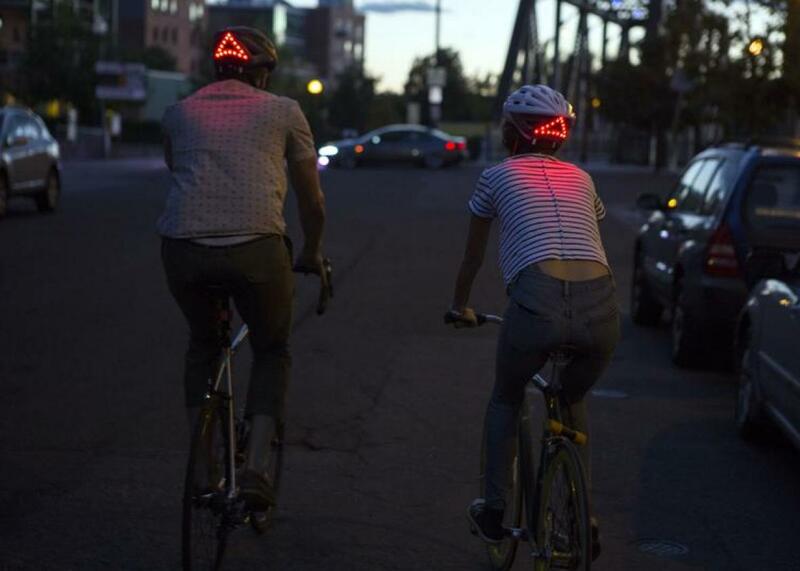 These can act as turn signals, operated by a remote you affix to your handlebars; the lights on back can also glow uniformly red when the helmet’s built-in accelerometer detects that you’re braking. This is a novel idea for bicycles: Until now, cyclists are expected to use hand signs to indicate their turning and braking intentions—hand signs that motorists may not know or notice and that may be impractical for cyclists to use depending on the situation. This update makes bike riders feel more similar to cars on the road and perhaps helps drivers better anticipate their movements. Like most bike lights, there is a variety of different flashing and solid light modes. The LEDs last up to six hours when flashing or three hours when glowing solid. For the typical 30- to 45-minute bike commute, that’s a week of riding before it needs a recharge—but you can always double-check in the app to be sure. You can switch the helmet’s lights on before you start a ride (there’s an easy-to-feel button centered just above its charging port on back), but you can also opt to turn it on as needed midride. I found this convenient for longer rides to ensure that I’d have battery life left as I returned home. The need to charge a helmet post-ride does feel silly— but I forget my bike lights on a semiregular basis, and I’m never going to roll without a helmet on my head. Lumos is on the hefty side: It weighs in at 440 grams (.97 pounds) compared with the 270 g (.6 pounds) of my $270 Giro Synthe race helmet. At $169, the Lumos is in line with many midrange cycling helmets, and while it does have a thicker profile than your average lid, I didn’t notice the extra heft once I started riding. It has a comfortable fit, but more importantly, it made me feel comfortable riding after dark. I normally avoid riding after sundown whenever possible. Even with powerful bike lights strapped to my ride and reflective accents on, I’ve had close calls with motorists not noticing my approach. 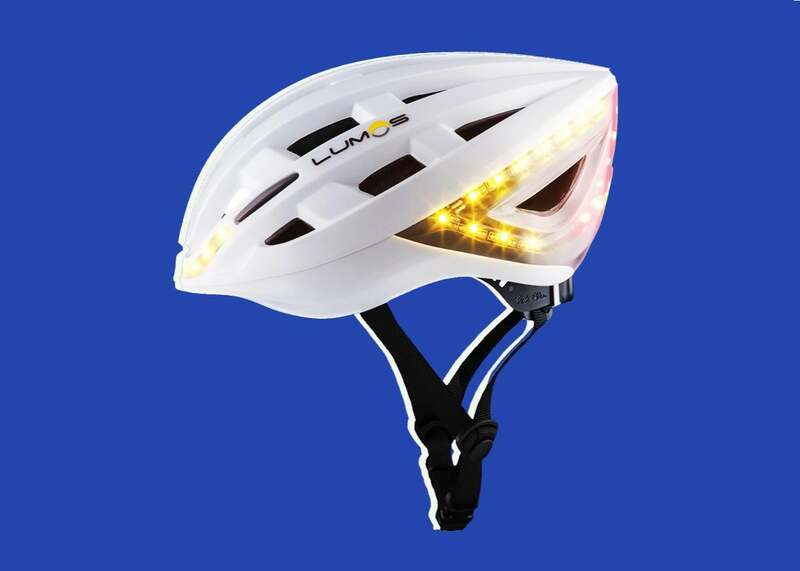 The Lumos helmet, unlike other safety gear, adds a significant extra layer of visibility: As I pull up to cars at a stop sign or intersection, my lights are closer to eye level with the drivers beside me, instead of hidden below their passenger-side window. With the helmet flashing on my head, I know they can see me. The lights are visible from quite a distance too, at least in my experience encountering other Lumos-helmet wearers on the road. Paired with a traditional front and rear bike light (as the company recommends), you may not feel invincible to cars on roadways, but you definitely don’t feel invisible—and that’s a big improvement in a situation where I typically feel quite vulnerable. This improved visibility is a huge step in road safety for everyone, whether riding at night or during the day. The cost (both to your pocketbook and the weight you lug on your bike) isn’t that great, and the built-in features are thoughtful, well-implemented, and easy to use. While I worry about the dangers of a lithium-polymer battery so near the brain in the event of a crash (given the occasionally exploding smartphone battery), reviewers who’ve crashed with the helmet have not had any issues thus far. That’s good news, because a light-laden bike helmet really does seem like a good idea—and if casual sightings on the street are any indication, it’s catching on.